Flower Pot for working space decoration! Create a good ambience for prosperity and creativity! How to be happy and efficientcy at work place? Decorate your working table is your answer! All colors of flowers for you to choose from. Wheter you like pink or blue, or your zodiac say so! 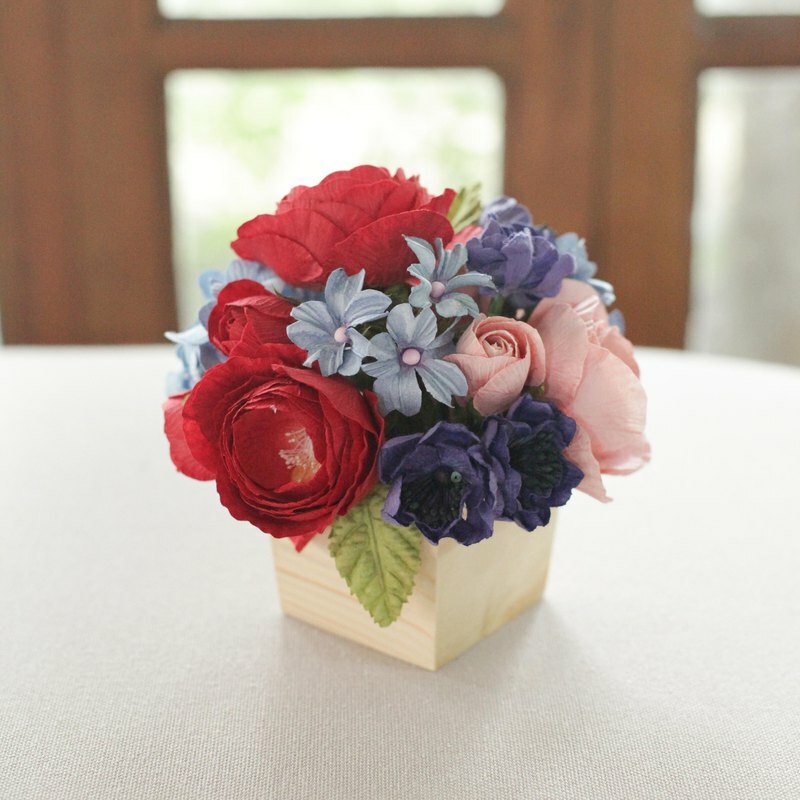 https://www.posieflowers.com/wp-content/uploads/2018/01/WP.jpg ● Material : Handmade Paper ● Perfect for : Decorate the working table ● Size - Container Size : width 10 cm. height 8 cm. - Container with Flower Size : width 13 cm. height 14 cm. ● Weight : 0.60 kg. ● Included - Wooden pot handmade of pine wood 1 cm. thickness, matte natural color - Floriology (meaning of flowers) hang tag inside - Scent inside. If the scent run out, you could use your own scent to fill in the center of flowers or if you like our flavour, "Posie Signature Scent" available for you to buy in our shop. ♡ WP101 Baby Flamingo https://www.posieflowers.com/wp-content/uploads/2018/01/WP101-3.jpg ♡ WP102 Lavender Heaven https://www.posieflowers.com/wp-content/uploads/2018/01/WP102-4.jpg ♡ WP103 Pastel Pink&Blue https://www.posieflowers.com/wp-content/uploads/2018/01/WP103-3.jpg ♡ WP104 Prosperous Red https://www.posieflowers.com/wp-content/uploads/2018/01/WP104-3.jpg ♡ WP105 Pure White https://www.posieflowers.com/wp-content/uploads/2018/01/WP105-3.jpg ♡ WP106 Glory Orange https://www.posieflowers.com/wp-content/uploads/2018/01/WP106-2.jpg ♡ WP107 Pink Green https://www.posieflowers.com/wp-content/uploads/2018/01/WP107-2.jpg ♡ WP108 Blue Velvet https://www.posieflowers.com/wp-content/uploads/2018/01/WP108-1.jpg ♡ WP109 White Ginger https://www.posieflowers.com/wp-content/uploads/2018/01/WP109-3.jpg ♡ WP110 Wild Blue Ginger https://www.posieflowers.com/wp-content/uploads/2018/01/WP110-2.jpg ♡ WP111 My Baby Blue https://www.posieflowers.com/wp-content/uploads/2018/01/WP111-3.jpg ♡ WP112 Pink Bloom https://www.posieflowers.com/wp-content/uploads/2018/01/WP112-3.jpg ♡ WP113 Barcelona Palette https://www.posieflowers.com/wp-content/uploads/2018/04/IMG_7575.jpg Handmade every parts in Chiang Mai, Thailand.